The horizontal and vertical scrollbars which the user can use to move content into view. Most of the controls that use scrollbars come with them built in, such as multiline text boxes, combo boxes etc. You can set the Value property yourself in code, which moves the scroll box to match. The controls Value property gets and sets its current numeric value. The Minimum and Maximum properties determine the range of values that the control can display. 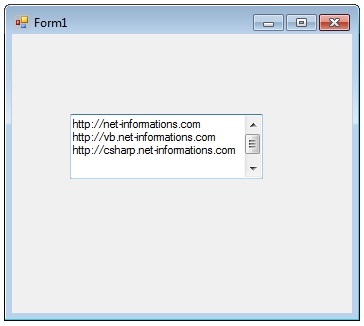 The following VB.Net program shows a TextBox control with scrollbars.